Posted 3/29/2018 5:01pm by Leslie Cooperband or Wes Jarrell. We’ve had a mini-baby boom this week as March draws to a close. Most of the does decided that evening was the best time to go into labor, leaving me lingering in the doe barn after feeding chores, patiently waiting for signs of progression, hoping that they would deliver before 9 pm. The faraway stare and lack of interest in feed (especially really good alfalfa hay) are the first signals that babies will come. These segue into pawing at the ground (we call this nesting behavior) and emergence of a mucus plug (birth fluid discharge). If the stars are aligned well, the next phase is active pushing and the bulge of the birth sac. The birth sac reminds me of the bubble that encased Glenda, the good witch of the North, as she descended into the land of Oz in the movie, "The Wizard of Oz." It’s opaque and it delivers goodness and beauty into the world. After all these years witnessing birth, I am always impressed by the repeatability of the process. I am also humbled when the process doesn’t follow the normal course, and I need to intervene. If the kid is presented properly, you can see the front hooves first, followed by the head. Once the head is visible, the body follows in short order and the baby is delivered. If we’re there to watch the process unfold, we have clean towels ready and waiting to catch the baby as he/she exits the birth canal. This way, we can clean the birth fluid off the face right away and make sure he/she is breathing. We hand off the sticky newborn to its mother to do the bulk of the cleaning. Some first time mothers are baffled by the alien before them, and refuse to clean their baby. Since our pregnant does are in a communal pen that they share with some of our older retired does, I am always heartened by the motherly instincts of does with no hormonal or genetic reasons to clean off the kids of another doe. Yet, there they are, Elaine and Shelly, two 10-year old sisters, pushing their heads into the warm gooey mess of the newborns, tongues vigorously licking off birth fluid, working their way from head to tail. The ties that bind us mammals are strong. Fundraiser Campaign Update: The support for the farm is humbling! Thank you SO MUCH to those who have contributed to our campaign thus far. This week, we hit the $10,000 mark. With these funds, we can definitely finish the roof on the pavilion. We still have other needed projects, and additional funds raised will go toward all the special projects we hope to accomplish this spring. If you aren’t yet familiar with our “Raise the Roof” campaign, please CLICK HERE, you can read all about it—our projects, our goals, our donation levels. As we’ve stated before, this community has been very good to us over the years. We hope you’ll consider making a donation (small or large) to help us “Raise the Roof” and take the farm to whole new level. We will also have a donation box out at the farm during spring open hours if you’d prefer to donate that way. Spring Open House: Our second spring open house (aka babies and breakfast) is this Saturday March 31st. Come on out to the farm from 9:30 am to 12:30 pm. Although we officially cancelled last week (because of that crazy spring blizzard), a number of you braved the elements to come out—THANK YOU!! So, this Saturday, the forecast is a bit iffy with possible rain, but a lot warmer than last week. Most activities—food, beverages, farm store, baby and momma goats-are indoors, so we will host the event, rain or shine. Fresh chevre special flavors: cinnamon sugar, caramelized onion—these will go great on those Lucky Pierre bagels (of course our regular flavors will too). Gelato: We have limited pint flavors (chocolate, salted caramel, fruitti di bosco and nectarine sorbetto) and gelato by the scoop (pistachio, vanilla, chocolate and coffee for sure). Goat Stew Meat and Cabrito Halves—we have a few packages of lean and tender goat meat available in our farm shop freezer. If you’ve never tried goat meat, you should. It’s very mild and lean (lends itself to slow cooking techniques). It would be a great alternative to lamb for the holidays. Build your own cheese board for the holidays-Grove Stone Class: Tonight--Thursday, March 29th, 6:30-8:30 pm, I will be teaching a class at Grove Stone in Champaign, IL on how to craft the perfect spring cheese and accompaniments board for the holidays. Whether you’re hosting guests for Easter or Passover, or just celebrating spring with some friends, this class will cover basic cheese styles and how to pair them with simple accompaniments (jams, vinegars, nuts, etc) and wine. Check out the details. You can sign up on the spot tonight. Babies and Brunch: Starting April 7th and running through May 12th, we’ll be serving brunch-Saturdays and Sundays, 9:30-1:00. Check out the fabulous menu that Chef Raquel and Sarah of Feast Catering have crafted as well as the details of how these brunches will be run. The format will be different than our “Spring Open Houses,” which have featured mostly grab and go type foods and beverages. More details to come next week. Cheese and Gelato CSA: The deadline to get our pre-season discount on Cheese and Gelato Shares ends this SATURDAY March 31st. If you’re not familiar with how our “CSA” works, I encourage you to check out the details. We have pick up locations in Champaign Urbana and Bloomington-Normal. We treat our CSA members like royalty. Come join our special club. Posted 3/24/2018 7:51am by Leslie Cooperband or Wes Jarrell. I am sorry to announce that we will be canceling the spring open house scheduled for this morning. We had thought that the weather would just be rain, but we've got a thick layer of slushy snow on the ground, and the forecast isn't look good for the remainder of the morning. In the eight years that we've been welcoming folks to the farm in the spring, we've never had to cancel our spring open house. We apologize for any inconvenience. If folks do venture out, please take care driving. The roads are not good. We will have hot beverages and food ready, just in case. The goats are tucked inside the barns, and will welcome visitors, regardless of the weather. Posted 3/22/2018 8:17pm by Leslie Cooperband or Wes Jarrell. It’s cold still. The water buckets have a layer of ice every morning that requires use of a blunt instrument to get to the frigid water underneath. The goats drink the cold water reluctantly; they’re thirsty after eating their hay and grain. The sun shines, but the pasture is in suspended animation. The pseudo warmth lures the goat girls out to graze, only to find them back in the doe barn within ten minutes rooting for hay. The chilled air bites our hands and faces, and as much as I’d like to take off my Carhart jacket while doing chores, it’s not coming off any time soon. 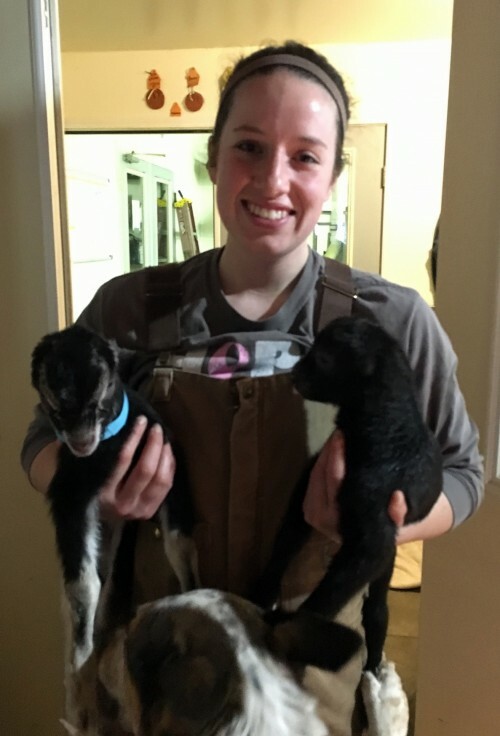 The frenzy of goat births has slowed to a trickle, and we’re getting caught up on the spring tasks that had to be put on hold—trimming hooves, vaccinating baby goats, cleaning out barns, composting waste hay, filling in tractor tire ruts. We’ve hit the 100 kids born on the farm mark, but it seems to have happened at a much more leisurely pace compared with last year’s record of 100 kids in 10 days. The edginess of kidding season anxiety is giving way to a more predictable routine of spring: milking, cheese making, kid feeding and cleaning when there’s time. 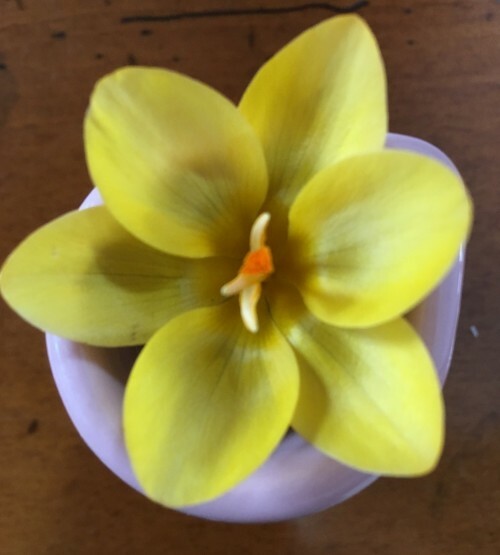 The orchard trees are getting pruned, the flower farm’s green house has early spring blooms, the daffodils inch their heads ever higher toward the sky each day. The vernal equinox will be fulfilled; spring will come, winter coat or not. Fundraiser Campaign Update: Thank you SO MUCH to those who have contributed to our campaign thus far. We have already raised over $2000. While we have a ways to go, we are grateful for the funds received that will go toward the special projects we hope to accomplish this spring. If you aren’t yet familiar with our “Raise the Roof” campaign, please CLICK HERE, you can read all about it—our projects, our goals, our donation levels. As we’ve stated before, this community has been very good to us over the years. We hope you’ll consider making a donation (small or large) to help us take the farm to whole new level. Spring Open House: Our first spring open house (aka babies and breakfast) is this Saturday March 24th. Come on out to the farm from 9:30 am to 12:30 pm. The forecast isn’t looking super great to be outdoors, but rest assured, we will keep you warm with hot beverages and heart-warming baby goats. Jams and Honey: We have a limited selection of jams from Autumn Berry Inspired, house-made jams and some beautiful bottles of fall honey from Two Million Blooms.These make great accompaniments to our cheeses. Gelato: We have limited pint flavors (chocolate, salted caramel, chai tea and maybe a few others) and despite the cold weather forecast, we will offer gelato by the scoop (as a New Englander who’s accustomed to eating ice cream in the dead of winter, I see no problem with enjoying a scoop of gelato when it’s below freezing outside). Build your own cheese board for the holidays-Grove Stone Class: Thursday, March 29th, I will be teaching a class at Grove Stone in Champaign, IL on how to craft the perfect spring cheese and accompaniments board for the holidays. Whether you’re hosting guests for Easter or Passover, or just celebrating spring with some friends, this class will cover basic cheese styles and how to pair them with simple accompaniments (jams, vinegars, nuts, etc) and wine. Check out the details and reserve your spot before they’re sold out. Babies and Brunch: Starting in April and running through May 12th, we’ll be serving brunch-Saturdays and Sundays, 9:30-1:00. Check out the fabulous menu that Chef Raquel and Sarah of Feast Catering have crafted as well as the details of how these brunches will be run. The format will be different than our “Spring Open Houses,” which have featured mostly grab and go type foods and beverages. More details to come in the next couple of weeks. Cheese and Gelato CSA: The deadline to get our pre-season discount on Cheese and Gelato Shares ends on March 31st. If you’re not familiar with how our “CSA” works, I encourage you to check out the details. We have pick up locations in Champaign Urbana and Bloomington-Normal. We treat our CSA members like royalty. Come join our special club. Looking for a goat for a family milker? How about for brush control or rural pet? Goats are wonderful working animals. We have great breeding stock with excellent health and milk records. Check out what's available and contact us if interested. Posted 3/15/2018 9:40pm by Leslie Cooperband or Wes Jarrell. The dark circles have re-appeared under my eyes. The nightly routine of checking the doe barn for signs of labor and the kid barn for sleeping baby goats spread evenly under their heat lamps has returned. The indulgence of watching a late night movie is over, and if it’s satiated, there’s hell to pay the next day. The mornings of pulling the covers over my head to garner another hour of sleep are fleeting. We are well in the thick of kidding season, and we don the familiar habits of early spring without much thought these days. Spring has come reluctantly this year. Despite winter’s strong desire to grip our temperate landscape a bit longer, the signs of change are all around us. Tiny little crocuses are poking their blooms just above the soil line, lest the cold winds knock them over. The pasture hue is transforming slowly from dull brown to pale green. The chickens are laying eggs more reliably. I must make an effort to observe these subtle changes. The routine of intensity takes over. The patterns have become so deeply etched in my psyche over time. Up before dawn (especially with day light savings time-cruel), turn on the coffee pot, climb into my coveralls and waddle out to the barns to see who has kidded and who’s in labor. New kids are cleaned off and put under heat lamps; sometimes it’s hard to sort out who belongs to whom, especially if multiple does have kids on the ground and the more motherly ones have “adopted” someone else’s kids. Once we sort out parentage, we move to milking out the mothers’ colostrum to feed to the hungry babies. If we’re lucky, we get a little break to eat some breakfast before the next wave of labor signs ensues. During the height of kidding season, the steps run together in an endless loop: contractions, birthing, kid cleaning, kid feeding, repeat. Sometimes, the kids are stuck in the birth canal and I must intervene. I put on the OB gloves, lube and iodine sanitizer, and gently enter the birth canal to untangle heads and limbs and ease them out of the womb into the world. These movements too have become second nature to me after all these years. There’s not much time for thinking, just moving and repeating the motions until temporary stability sets in. Then, it’s time to catch some precious sleep. Fundraiser Campaign: It’s hard for farmers to ask for money. We are a proud and mostly self-reliant bunch. Sometimes, though, changes need to happen and improvements need to be made to make the farm grow and be a better place for more people to enjoy. So, we’re hosting a “raise the roof” fundraiser campaign this spring. If you CLICK HERE, you can read all about it—our projects, our goals, our donation levels. This community has been very good to us over the years. We hope you’ll consider making a donation (small or large) to help us take the farm to whole new level. Farm Yard Sale: It’s time for spring cleaning at the farm. We’ve got all kinds of stuff we’re ready to part with: fencing, used equipment, a couple of milk bulk tanks without compressors, kitchen stuff, etc. Come out to the farm this weekend to peruse our stuff—Saturday and Sunday, March 17/18, 11-4 each day. Everything must go, so we’re making lots of deals. We have a free-cycle pile too. The farm shop will be open for cheese and gelato sales and we’ll sell some of our well-aged goat manure compost if you bring your own container ($5/5 gallon bucket). Spring Open House: Our first spring open house (aka babies and breakfast) is March 24th. The second one is March 31st (Easter weekend). More details forthcoming next week. Mark your calendars now. Babies and Brunch: Starting in April and running through May 12th, we’ll be serving brunch-Saturdays and Sundays, 9:30-1:00. Check out the menu and the details. Special Graduation Dinner & Mother’s Day Brunch: We are offering a special farm to table dinner for graduates and their families on Saturday May 12th AND a local-foods brunch buffet for Mother’s Day. Check out the menu for dinner and/or brunch and book your tickets now! They’re going fast. Cheese and Gelato CSA: Want to be a member of a very special club? Consider joining our Cheese and Gelato CSA. CSA stands for "Community Supported Agriculture." This translates to a special relationship between patron and farmer. We provide you with bi-weekly (twice/month) shares of cheese and/or gelato for about 6 months. Our special discounted pricing is available through the end of March, so if you want to learn more and then sign up, don't delay. Dinners on the Farm: Our 2018 season is now posted on our website and ticket sales are LIVE for the entire season. Take a look at the dates and themes, and book your reservations NOW. These tickets go fast, so don’t delay. Posted 3/11/2018 7:59pm by Leslie Cooperband or Wes Jarrell. In between birthing goat babies, we've been busy finalizing a few more farm to table events for the season. We've added a special "Graduation Dinner on the Farm-May 12th," a Mother's Day Brunch Buffet and several more "Dinners on the Farm" fall dates. Our first spring open house is only a couple of weekends away (March 24th). I'll be back in touch with more farm news and details about spring open house, but I wanted to make sure you all know about these upcoming events, so you can get your tickets now. Posted 2/23/2018 8:59pm by Leslie Cooperband or Wes Jarrell. The winter has been long and true. The pervasive greyness seems to blanket the entire landscape, from the soggy slumbering soil to the far-off horizon. Since early January, amidst the backdrop of arctic blasts and northwest fogs, the farm has been on a slow simmer of incubating baby goats. The first doe kidded this morning---twins. Artemis (we call her Artie) nonchalantly separated herself at feeding time and dropped her kids in quick succession between pitch-fork loads of haylage being placed in the mangers. The drip of kidding season has begun, as much as I try to will it to hold off a little longer. In the next few weeks, the drip will quicken to a torrent. I’m bracing myself for joy and sleep deprivation alike. Erica with the "artie" twins. Blue, our dog, loves to clean the newborns! Huckleberry Blue with Barley Wine Wash: this raw-goat-milk blue is creamy, slightly sweet, salty and tangy—pretty darn delicious! Today is National #CSA sign-up day. Since the day is almost over, I’m proclaiming the whole weekend as National CSA sign-up day. If the idea of being a member of a special cheese and gelato club sounds enticing, check out our CSA. We’re running a special discounted price through March, but sign up now to show your love of farmstead and artisan goat cheese! We’re attending the Champaign-Urbana CSA Fair next Friday, March 2nd, so if you want more details come see us just behind Common Ground Food Coop from 5-7:30 pm. 2018 “Dinners on the Farm” select tickets on sale NOW! We’ve been busy scheming for the upcoming dinner season, and we have several late spring/summer dates and themes fleshed out. We’re pretty excited about the line-up this year! You can visit our website to see all the descriptions and then book reservations through our ShowClix page. 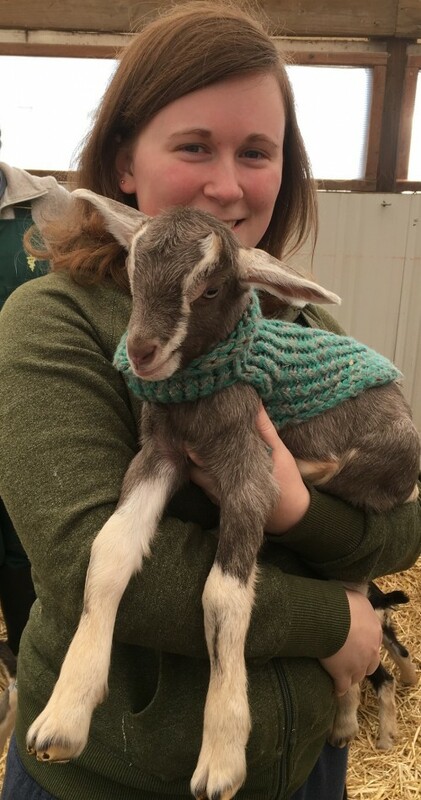 2018 Spring Open Houses and “Goat Babies and Brunch” Goat babies bring milk which brings cheese which brings you our patrons back to the farm. This year’s spring open houses and “babies and brunch” will be run differently than in recent years. Click here to get all the details. Posted 1/10/2018 9:57pm by Leslie Cooperband or Wes Jarrell. Stasis, maintaining equilibrium with minimum effort; this is our modus operandi in winter. Subzero temperatures, snow storms, floods and high winds try to push us off our low-energy program. Goats must be fed and watered, hay must be moved from the loft to the barns, water buckets must be cleaned, chicken eggs must be collected, electricity must continue to run, water must continue to flow in pipes, wholesale customers must be satisfied and aging cheeses must be tended. Thoughts of the season to come emerge, but are pushed back into temporary recesses. We will also bring some goat stew meat and goat merguez sausages and a few other goodies from the farm. Blue Moon Farm will be there too. It’s a great way to fight back the doledrums of winter. Consider signing up for a season’s worth of cheese and gelato. Our CSA is customizable and flexible—you choose how many pieces of cheese or pints of gelato you want per pick up and then select the types of cheese or flavors of gelato during the season. We have a 3% discount off the total price through the end of February. Become a member of an exclusive and pampered club and help the farmer too! Last chance to come to the farm this year AND HAPPY HOLIDAYS! Posted 12/21/2017 7:53pm by Leslie Cooperband or Wes Jarrell. Happy Holidays to All. Thank you for supporting the farm. We look forward to seeing you in the New Year. Apollo's helping himself to the beverage cart! Time to party! The winter solstice is upon us. All of our goats are dry and almost all are pregnant. We're almost ready to begin our own winter "chill," but we're opening the farm up ONE more time for any last minute holiday shoppers or anyone who needs a break from the holiday madness. The goats are master de-stressers, and who wouldn't love a cup of hot mulled cider. We still have some cheese (limited repertoire) and LOTS of gelato. Moonglo: our raw-milk tomme-style cheese, aged for about 4 months. Semi-firm texture, fruity and sharp flavor notes. Make yourselves a “fancy” grilled cheese with Moonglo and our onion jam (or caramelized onions). Gelato Pint Flavors: Our gelato flavors are the perfect accompaniment to your holiday sweets and desserts! Buy three pints and get a discount: HOLIDAY SPECIAL—we made a very special batch of pistachio gelato with pure Sicilian pistachio paste. This is a premium flavor ($12/pint versus $10/pin for our regular flavors), but it’s totally worth it! There are only a few pints o pistachio left, so come early. The Real Stand is stocked to the brim with sustainably-raised farm products and local artisan crafts. In addition to our cheese and gelato, we have pickled veggies jams, meats, sausages, eggs, etc. To sweeten the pot, we're running a special 10% discount on all PFFC "Merch" (t-shirts, onesies, sweatshirts, cheese boards, notecards, tea towels-anything with our logo). 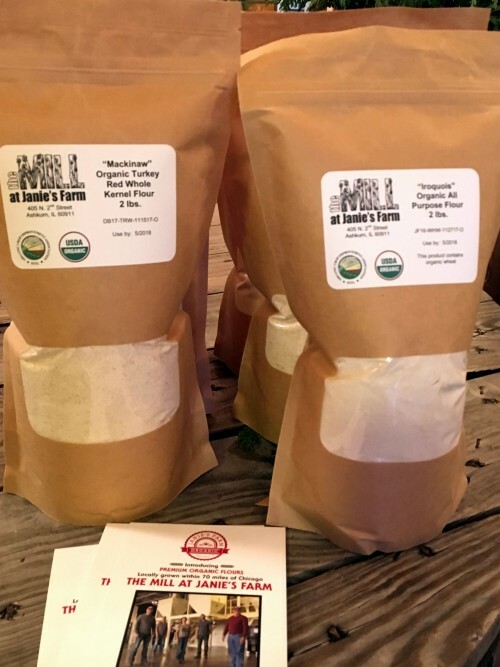 NEW IN THE STORE—locally milled organic wheat flour (2 lb. bags) from “The Mill at Janie’s Farm!” We’re so excited to offer this product to our customers. The wheat is grown and milled in central IL, right in our own farming backyard. Want to get a PFFC gift card for that hard to please person on your gift list? Check out our Credibles card program. 2018 Cheese and Gelato CSA Season is Open for Sign-Ups--5% discount ends at the end of December-ACT NOW. We welcome returning and NEW members alike. We’re already planning ahead for next year. If you’re not familiar with the concept of CSA (Community Supported Agriculture), think of it as a private farm club. Patrons (CSA members) support the farmer by buying a season’s worth of farm products ahead of time—in our case, cheese and gelato-- and members get treated like royalty with special cheeses and gelato flavors throughout the season. If you sign up now or before the end of December, you’ll get a 5% discount off the total price. Become a member yourself or consider buying a CSA membership for the cheese lover in your life. After four glorious seasons, one of our cheese makers is leaving to pursue her own dreams of a small farm. We are looking for a cheese maker to start in early March 2018. Check out the position description and application details if you’re qualified and interested. Posted 12/14/2017 10:19pm by Leslie Cooperband or Wes Jarrell. 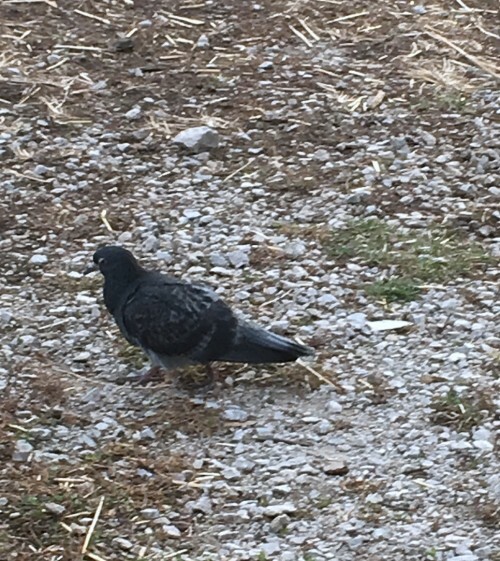 Last Sunday, a lone black and grey pigeon appeared at the entrance to the farm shop, seeming to have dropped randomly out of the sky. The sight of a pigeon on the farm is incongruous. It’s like a visit from mid-town Manhattan socialite in heels and a slinky black evening dress. He/she (we don’t know how to identify the gender of a pigeon but let’s assume it’s a “she” for now) acts as if she knows she is out of place. She is calm yet cautious and stays close to the barn, sifting and pecking at the ground for stray grains of wheat from fallen straw. She seems content but lonely. She doesn’t seem to be fearful of humans (or dogs for that matter), causing us to wonder if she is someone’s pet. She isn’t banded, so we’ve ruled out the homing pigeon hypothesis. We suspect that maybe she was blown in on the fierce winds we’ve been having these past few days and that maybe her wings are damaged. She seems to be able to fly short distances, but doesn’t seem to be in any hurry to get back to wherever she came from. Her silence deepens the mysteries around her. I am beginning to wonder if her sudden appearance has some deeper underlying meaning. Was she sent here to remind us to care for the stranger among us? Does this urban bird symbolize the encroachment of the city on the farm? Is her loneliness a reminder to keep tabs on the folks who are on their own during the holidays? I have no answers to these questions. If she decides to stay, we’ll start giving her some chicken feed and welcome her into the rest of the farm family of strays and stragglers. There’s not much time left before the holidays descend upon us. We’re doing our part to keep you and your guests in high-class cheese and gelato. We also have some fantastic local artisan gifts and Prairie Fruits Farm “merch” that make wonderful and unique gifts for the special folks on your lists. Please come visit us either at the market or at the farm this weekend. Pelota Roja: we saved a wheel of this Rick Bayless cheese exclusive to offer to those patrons who get to the market early enough to snag a wedge. It’s made in the same style (manchego) as our Magia Negra, but the rind is rubbed with a guajillo chile-olive oil paste, giving the cheese a slight piquant flavor from the chiles. Gelato Pint Flavors: Our gelato flavors are the perfect accompaniment to your holiday sweets and desserts! Buy three pints and get a discount: HOLIDAY SPECIAL—we made a very special batch of pistachio gelato with pure Sicilian pistachio paste. This is a premium flavor ($12/pint versus $10/pin for our regular flavors), but it’s totally worth it! The farm is OPEN—weekends, 1-4 pm now through Sunday December 17th. Depending on our mood, we might also be open on Saturday, December 23rd, and we’ll let you know next week if that’s the case. The Real Stand is stocked to the brim with sustainably-raised farm products and local artisan crafts. We have cheese, gelato, lots of pickled veggies, jams, meats, sausages, eggs, etc. In addition to the unique and beautiful gifts you’ll find, we are also selling holiday wreaths by Delight Flower Farm. NEW IN THE STORE—locally milled organic wheat flour (2 lb. bags) from “The Mill at Janie’s Farm!” We’re so excited to offer this product to our customers. The wheat is grown and milled in central IL, right in our own farming backyard. Saturday, the 16th, we’ll be offering winter holiday hay rides—1:30, 2:30 and 3:30 (20 person capacity per ride). The weather should be mild, but we have blankets to cover you up and keep you warm. We take folks to a part of the farm that most seldom get to see-the eastern edge of our property where the goats browse on the restored prairie and riparian hedge. It’s quite beautiful. Hay ride costs: $5/adult and $3/children (children less than 1 yr. old are free). After your ride, come into the farm shop and warm up with a cup of mulled hot cider (thank you Curtis Orchard). Check out all the details on our FACEBOOK events page. If you can’t make it out on Saturday, no worries-we’re open Sunday, December 17th 1-4 pm too! Come out to join Delight Flower Farm for one of their workshops (herbal salve making workshop OR final wreath making workshop) and then grab some warm mulled cider or a cup of espresso and gelato and RELAX at the farm for a while. The goats will be happy to get some extra lovin’ before the season ends. We’re already planning ahead for next year. If you’re not familiar with the concept of CSA (Community Supported Agriculture), think of it as a private farm club. Patrons (CSA members) support the farmer by buying a season’s worth of farm products ahead of time—in our case, cheese and gelato-- and members get treated like royalty with special cheeses and gelato flavors throughout the season. If you sign up now or before the end of December, you’ll get a 5% discount off the total price. Become a member yourself or consider buying a CSA membership for the cheese lover in your life. Posted 12/8/2017 12:42pm by Leslie Cooperband or Wes Jarrell. The season is, at last, behaving like “the season.” The verdant warmth of last week has been usurped by frigid gusts. Opening the door to let the dogs out in the morning shocks my naked toes. The mid-day sun tries to confer its warmth on any exposed flesh, but the winds whisk it away immediately. We’re back to slow drip faucets in the barns at night (to prevent the pipes from freezing) and extra layers of fresh straw to keep the goats cozy at night. The evening milking requires even more coercing than normal for this time of year. The promise of grain just doesn’t cut it. Soon, we will go to once-a-day milking, to hasten the inevitable end of their lactation. Many of the does have already taken matters into their own hands (well, hooves), and decided that their milking season is over. Most of them are bred based on the amount of buck lounging we’re seeing in the breeding pens. The goats are really good at telling us when it’s time for rest. Angel Food: our little “crottin” style bloomy rind; small enough to eat in one sitting; great warmed with a drizzle of honey; perfect for holiday entertaining. Moonglo: our raw-milk tomme-style cheese, aged for about 4 months. Semi-firm texture, fruity and sharp flavor notes. Make yourselves a “fancy” grilled cheese with Moonglo and our onion jam. 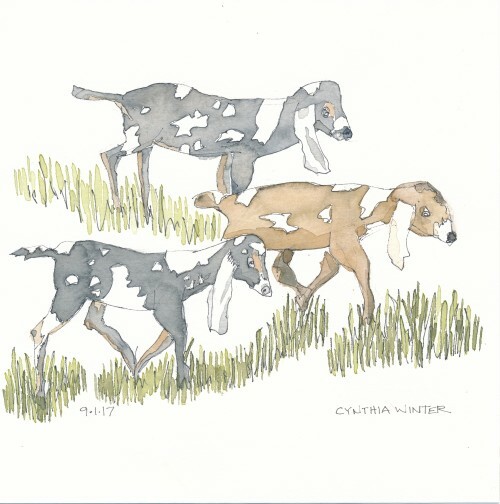 This beautiful watercolor by Cynthia Winter (one of our farm patrons) has been turned into a note card, available for purchase at our farm store, The Real Stand. The farm is OPEN—weekends, 1-4 pm now through December 17th. The Real Stand is stocked to the brim with sustainably-raised farm products and local artisan crafts. We have cheese, gelato, lots of pickled veggies, jams, meats, sausages, eggs, etc. In addition to the unique and beautiful gifts you’ll find, we are also selling holiday wreaths by Delight Flower Farm. Back by popular demand—SATURDAY, DECEMBER 9TH—THE GOAT PHOTO BOOTH! Bring your friends and family to the farm and take your holiday pictures with our santa and elf goats. 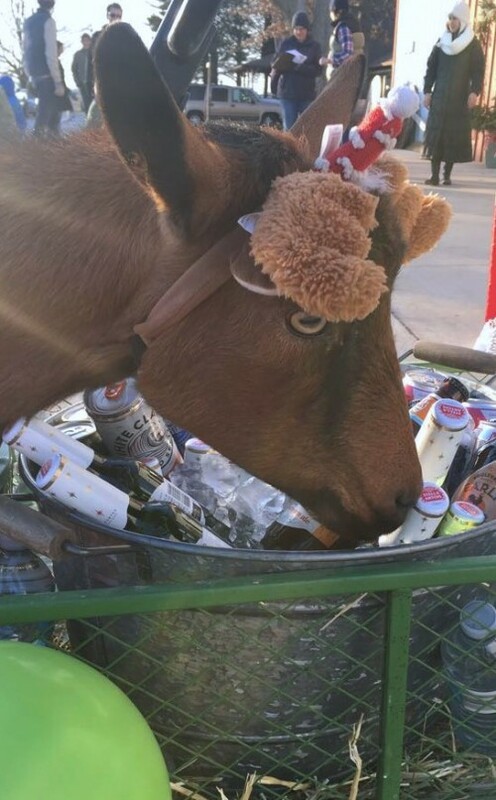 They might try to nibble on your hair or hats, but we’ll keep them distracted with goat treats. We know it will be cold tomorrow, so dress warmly. The photo booths (we have two stations) will be set up inside our kid barn, out of the wind, so you should be nice and toasty. We will also have warm “glugg” (mulled fortified wine) and hot tea, espresso drinks and fresh doughnuts from Lucky Pierre Bakers. SUNDAY, DECEMBER 10TH—BEAT THE CROWDS (farm and The Real Stand are open 1-4 pm)—come out to the farm, visit with the goats and then come inside the shop to warm up. Enjoy an espresso or affogato (gelato + espresso) or a warming cup of glugg. Sunday special: buy one Angel Food (mini-brie), get another at 50% off!!! 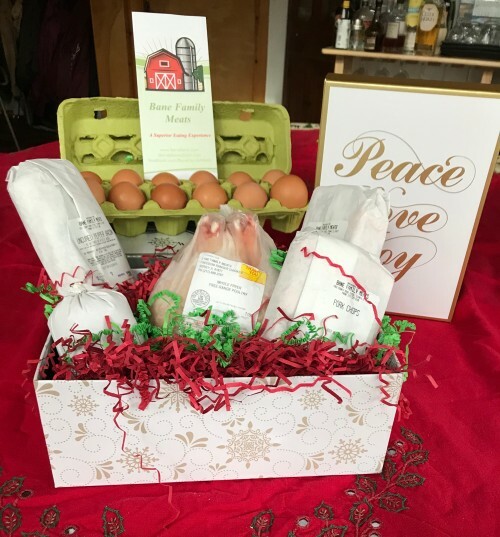 Bane Family Meats is now offering Holiday Gift Baskets! Each basket is made to order. Choose from eggs, pork (bacon, sausage, chops, roasts, ground pork), beef (steaks, roasts, ground beef), and/or lamb (chops, steaks, roasts, ground lamb). Prairie Fruits Farm will even include a container of fresh chevre if you like. Call or email for ideas and prices at DavidPBane@aol.com or 217-722-2188. Happy Holidays! 2018 Cheese and Gelato CSA sign-up We are working out the details and logistics for next year’s CSA. We will be in touch once we’re ready for early-bird sign ups. Stay tuned.